I went to Safeway’s today and they had half hams for 49 cents a pound. For that price I could not pass one up. I like to cut these up into one inch streaks and freeze them for future meals. Tonight, I was already planning to make a sweet potato soup for Jan, but I knew that Eilene would like a bite of ham. She has been feeling a bit protein starved lately. I saved a couple of small ham steaks for our dinner. When Jan saw the ham on our plates, she begged for a taste. However, because of her oral surgery I would have to turn it into baby food. Dry ham by itself does not blend well. I saw the leftover apple sauce and crème fraîche that I had made to garnish the soup and I decided that it would be a good liquefier for the ham. It was. After Dinner Note: This was very tasty and satisfied Jan’s protein hunger. She pointed out that it would be a good topping for an hor d’oeuvres cracker. 1. 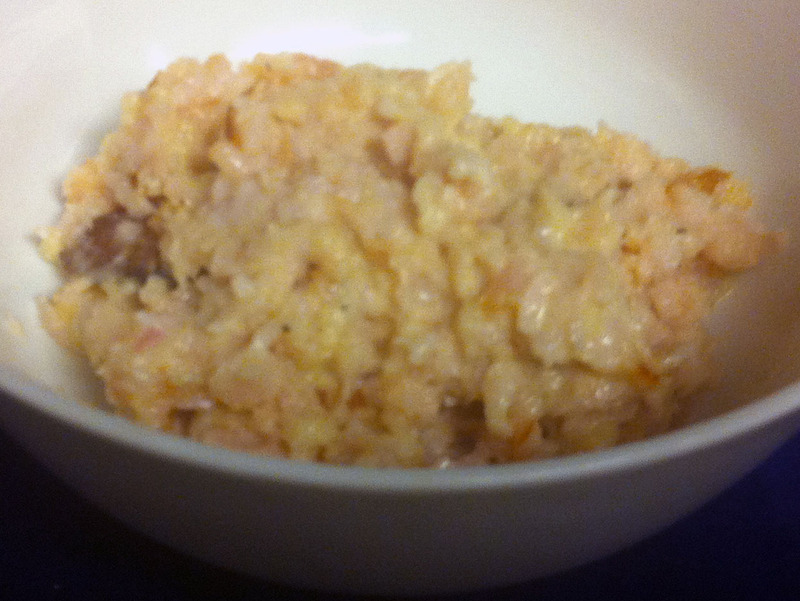 Put the ham, apple sauce, and crème fraîche in a standing blender, or food processor. Pulse the blades until the ham in minced into small bits. Tip: You are not looking to turn the ham into a paste, just process the mixture until the ham is in fairly small bits. 2. Chill the spread for 30 minutes and then spread it onto the crackers. Serve immediately. Tip: The spread is fairly moist and you do not want the crackers getting soggy.